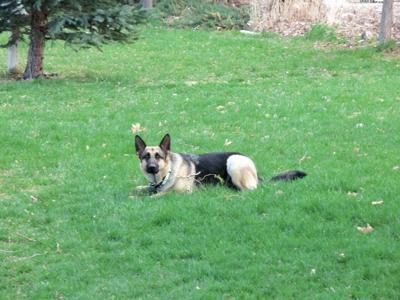 We own a female GSD (3 yr old) who loves to run. We live on @ 1 & 1/2 acre. Every morning when I go out to feed my Morgan horse, Saydee has to come too. Saydee will sprint / run around the horse arena just like a race horse. Saydee's "time" is @ 5-6 seconds. Everyone is amazed at this. Saydee is very athletic with this "exercise" program. The photo attached is Saydee's "ready to start" launch look. Join in and write your own page! It's easy to do. How? Simply click here to return to Dog Stories.